Deb Perelman didn’t set out to become a famous cook, a professional photographer or the author of an award-winning blog, but she is all of these things now. She’s the author of SmittenKitchen.com, a website with recipes for seasonal, easy-to-prepare food that includes how-to photographs and casual commentary on cooking and life. In her newly published cookbook, she brings the Smitten Kitchen website to the hard copy world. Please join us for a conversation with Deb Perelman on the joys of cooking at home. Excerpted from THE SMITTEN KITCHEN COOKBOOK by Deb Perelman. Copyright © 2012 by Deb Perelman. Excerpted by permission of Knopf, a division of Random House, Inc. All rights reserved. No part of this excerpt may be reproduced or reprinted without permission in writing from the publisher. Nevertheless, there’s no reason to limit this salad to the summer’s burger and hot dog toppings. We eat it with pork chops and beside pressed sandwiches, and I regularly have it for lunch in January when I’m trying to offset holiday excess. That said, it’s equally delicious with additional fried excesses, from everything Milanese and schnitzel to fried chicken. The ingredients list is short and its fridge life is long, or as long as it takes for other family members to get hooked on it. Toss the cabbage, cucumber, and dill together in a large bowl. Don’t be freaked out by how big the salad looks; it settles as it marinates. Whisk the vinegar, salt, and sugar together in a small bowl until the salt and sugar dissolve. Stir in the water. Pour the liquid over the salad, and let it marinate, tossing the cabbage occasionally. After 1 hour, it should be a bit wilted and crunchy; at 2 hours, the flavor is even better. Generally, I think muffins are best on the first day, but these surprise me by being twice as moist, with even more developed flavors, on day two. They’re just a little less crisp on top after being in an airtight container overnight. The salad keeps, covered, in the fridge for a week. one time when I decided to make nothing but delicate flatbreads for dinner. It was a terrible idea. Don’t do this unless you want to spend three days making doughs and mincing vegetables, only to have everyone leave hungry. I’m pretty sure if you asked my friends what the very best thing I’ve ever served them was, they’d still go on about chicken pot pies I made from an Ina Garten recipe all those years ago. People, it turns out, go berserk for comfort food— especially comfort food with a flaky pastry lid—doubly so on a rainy night. I liked them too, but the chicken— which often ends up getting cooked twice— has always been my least favorite part. What I do like is the buttery velouté that forms the sauce, and it was from there that I decided to make a pot pie I’d choose over chicken, peas, and carrots any night of the week. You really have to try this for a dinner party, especially if your guests were expecting something fancy. The crust and stews can be made up to 24 hours in advance, and need only to be baked to come to the table; this means that you could spend that time getting cute, or at least making pudding for dessert. And if people are expecting the same old same old beneath the lid, this will be a good surprise— the lid is so flaky, it’s closer to a croissant than a pie crust, and the pancetta, beans, and greens make a perfect stew, one you’d enjoy even without a bronzed crust. But, you know, it helps. spatula, stir the wet and the dry together until a craggy dough forms. If needed, get your hands into the bowl to knead it a few times into one big ball. Pat it into a flattish ball, wrap it in plastic wrap, and chill it in the fridge for 1 hour or up to 2 days. flakes, and a few pinches of salt, and cook over medium heat until the vegetables are softened and begin to take on color, about 7 to 8 minutes. Add the garlic, and cook for 1 minute more. Add the greens and cook until wilted, about 2 to 3 minutes. Season with the additional salt and freshly ground black pepper to taste. Transfer all of the cooked vegetables to the bowl with the pancetta, and set aside. Wipe out the large saucepan; don’t worry if any bits remain stuck to the bottom. Then melt the butter in the saucepan over medium- low heat. Add the fl our, and stir with a whisk until combined. Continue cooking for 2 minutes, stirring the whole time, until it begins to take on a little color. Whisk in the broth, one ladleful at a time, mixing completely between additions. Once you’ve added one- third of the broth, you can begin to add the rest more quickly, two to three ladlefuls at a time; at this point you can scrape up any bits that were stuck to the bottom— they’ll add great flavor. Once all of the broth is added, stirring the whole time, bring the mixture to a boil and reduce it to a simmer. Cook the sauce until it is thickened and gravylike, about 10 minutes. Season with salt and pepper. Stir the white beans and reserved vegetables into the sauce. lids with egg wash, then cut decorative vents in each to help steam escape. Bake until crust is lightly bronzed and filling is bubbling, about 30 to 35 minutes. The dough, wrapped twice in plastic wrap and slipped into a freezer bag, will keep for up to 2 days in the fridge, and for a couple months in the freezer. The filling can be made up to a day in advance and stored in a covered container in the fridge. olive oil instead of 1. My list of rice pudding loves is long. There’s the Danish risalamande, with chopped almonds, whipped cream, and a sour cherry sauce, usually served at Christmas with a prize inside— one that I never win, not that I’ve been trying for thirteen years at my best friend’s house or anything. There’s kheer, with cardamom, cashews or pistachios, and saffron. There’s rice pudding the way our grandmothers made it, baked for what feels like an eternity, with milk, eggs, and sugar. And there’s arroz con leche, which is kind of like your Kozy Shack went down to Costa Rica for a lazy weekend and came back enviously tan, sultry, and smelling of sandy shores. As you can tell, I really like arroz con leche. But this — a riff on one of the best variants of arroz con leche I’ve made, which, in its original incarnation on my site, I adapted from Ingrid Hoffmann’s wonderful recipe— is my favorite, for two reasons: First, it knows me. (That’s the funny thing about the recipes I create!) It knows how preposterously bad I am at keeping stuff in stock in my kitchen, like milk, but that I seem always to have an unmoved collection of canned items and grains. Second, it’s so creamy that it’s like a pudding stirred into another pudding. The rice is cooked first in water. I prefer to start my rice pudding recipes like this, because I’m convinced that cooking the rice first in milk takes twice as long and doesn’t get the pudding half as creamy. Also, it gives me a use for those cartons of white rice left over from the Chinese take- out I only occasionally (cough) succumb to. Then you basically cook another pudding on top of it, with one egg and three milks— coconut, evaporated, and sweetened condensed— and the end result will be the richest and most luxurious rice pudding imaginable. But why stop there? For the times when the word “Enough!” has escaped your vocabulary, I recommend topping it with a dollop of cinnamon- dusted whipped cream, for the icing on the proverbial cake. Put the rice, 2 cups of water, and the salt in a medium saucepan with a tight- fitting lid. Bring to a boil— you should hear the pot going all a flutter under the lid and puffing steam out the seam. Reduce to a low simmer, and let the rice cook for 15 minutes, until the water is absorbed. Remove the rice pot from the heat. Once the rice is cooked, whisk the egg in a medium bowl, and then whisk in the evaporated milk. Stir the coconut and sweetened condensed milks into the rice, then add the egg mixture. Return the saucepan to heat and cook the mixture over medium- low heat until it looks mostly, or about 90 percent, absorbed (the pudding will thicken a lot as it cools), about 20 to 25 minutes. Stir in the vanilla extract, then divide the pudding among serving dishes. Keep the puddings in the fridge until fully chilled, about 1 to 2 hours. Whip the heavy cream with the confectioners’ sugar until soft peaks form. Dollop a spoonful of whipped cream on top of each bowl of rice pudding, dust with ground cinnamon, then enjoy. If you have 2 cups of leftover white rice, you can skip the first step, and jump in with the egg and three milks. She hasn’t said so in so many words, but I have a hunch that my editor thinks I should explain why it took me no fewer than seven muffin recipes to stop fussing and find the perfect one to tell you about. Are muffin recipes that hard to come up with? No, not really. Do we perhaps just enjoy eating muffins so much that I looked for excuses to make more? Unfortunately, not that either. Am I really so terribly indecisive? Apparently, yes, but only in what I believed to be the quest for the greater muffin good. Okay, fine, and when I’m choosing earrings. What finally led me here was, innocently enough, a basket of boring- looking lemon– poppy seed muffins at a bakery one morning; they got me wondering when poppy seeds would come untethered from lemon’s grasp. Poppy seeds are delightful on their own— faintly nutty bordering on fruity— but they also play well with fruit that is richer in flavor and texture than lemon. Inspired, I went home and, a short while later, finally pulled a muffin out of the oven I’d change nothing about. Poppy seeds, plums, browned butter, brown sugar, and sour cream form a muffin that’s rich with flavor, dense with fruit, and yet restrained enough to still feel like breakfast food. Seven rounds and six months in, I bet somewhere my editor is breathing a sigh of relief. You don’t create seven muffin recipes in a year without learning a few things. I found that you could dial back the sugar in most recipes quite a bit and not miss much (though, if you find that you do, a dusting of powdered sugar or a powdered- sugar– lemon- juice glaze works well here); that a little whole- wheat fl our went a long way to keep muffins squarely in the breakfast department; that you can almost always replace sour cream with buttermilk or yogurt, but I like sour cream best. Thick batters— batters almost like cookie dough— keep fruit from sinking, and the best muffins have more fruit inside than seems, well, seemly. And, finally, in almost any muffin recipe, olive oil can replace butter, but people like you more when you use butter— and if you brown that butter first, you might have trouble getting them to leave. MS. DIANE REHMThanks for joining us. I'm Diane Rehm. In her words, she's just a person who likes to cook, but more than five million people may beg to differ. That's the number of monthly visitors to Deb Perelman's website, smittenkitchen.com. Deb Perelman offers seasonal recipes and how-to photographs, but she stands out for her down-to-earth approach to both cooking and life. MS. DIANE REHMShe's published her first book. It's titled "The Smitten Kitchen." Deb Perelman joins me to talk about cooking at home. I hope you'll join in the conversation. Call us on 800-433-8850, send us your email to drshow@wamu.org, follow us on Facebook or Twitter. Debbie, it's so good to meet you. MS. DEB PERELMANThank you for having me. REHMFirst thing, I have to know why and how you became smitten. PERELMANI actually always enjoyed the double definition of the word, the idea of smiting something, also being smitten, and I think it's definitely leaned towards the latter, but I like words that are kind of double entendres like that. REHMBut did you start cooking as a young child? Did you become smitten with food preparation, and even later on photography? REHMShe did the whole thing practically. PERELMAN...each margin. And to this day, if we're having company, it's still Beef Bourguignon and onion soup, so I love it. So I definitely was around cooking, and I, you know, my mom taught herself to cook from Julia Child, so I think I inherited her lack of intimidation by recipes -- from recipes, but I also -- but I didn't really start cooking with enthusiasm until I became an adult and, you know, it was time to make dinner and nobody was doing it for me. REHMAnd so you did it early on. Can you remember some of the first recipes you used? PERELMANI remember this one day, and I don't know how much I participated in it, but I remember my parents got some hair-brained idea that they wanted to make bagels. Just a normal Saturday afternoon thing to do, right? But -- and I remember thinking it was so crazy. Like, you could make them at home, and then I remember that they got bored of making bagels and they tried to twist a couple into pretzels doing the boiling and the baking too. PERELMANSo I must have left an impression, because when I, you know, started cooking on my own, I was like bagels, pretzels, no big deal. You can totally do that at home, and I think it was great to have these crazy ideas in my head. REHMAnd what about the blog? How did that begin? PERELMANYou know, I started the site as -- I was looking for a place where I could share these recipes. I got kind of obsessed with. You know I started collecting recipes that I felt worked every time, exceeded expectations, didn't waste your time, and used fairly simple ingredients. I'm always looking for ways to use every day ingredients in better ways, so you don't need to run to specialty stores or spend a fortune on groceries to cook great food. PERELMANSo as I started having these recipes, I wanted to put them up somewhere. I wanted to share them. And I didn't want to just share them, I wanted to tell you about them, like, you know, not just here's a great recipe for buttermilk pancakes, but why the buttermilk, why this recipe, here's how much fruit you could add to it, here's what you could do to make it whole wheat. So that's really where I -- where the site came about. REHMWere you surprised at the reaction? PERELMANWell, I expected the site to last six months. That about brings us up to today. I started it six years ago and I thought it would last about six months because that was what I saw being the average, you know, the half life of most online projects. I just didn't -- I didn't think that people that were going to glom onto the site for lack of a better term. I thought that people wanted a cooking philosophy. PERELMANYou know, I read a couple food blogs, and I read a lot of food magazines, and they were written by -- articles were written by people with a very clear cooking philosophy. They were either doing like Texas cooking or barbeque or only French, you know, pastries, and I didn't have that. I just like to cook, and I like recipes that work. And so I didn't expect people to attach themselves to that, and I didn't think it would last very long. REHMAnd what about the photography? When did that begin for you? PERELMANI just started -- I wanted to take a certain kind of pictures. I love cookbooks, and I love food magazines, and they have these gorgeous, gorgeous photos, and everyone looks at those pictures, and they want their food to look that way. But I don't -- I don't -- I'm not entirely sold on how well those pictures help you cook better. I think that those detailed photos where you can see how the apples are chopped, what is the color of toasted walnuts, those things -- those are the things that, you know, if you can get pictures of these then too, I think they help inform nervous cook at home. PERELMANSo I was interested in taking photos like that. I did not then, and now as well, barely know anything about photography. I don't know what half the buttons on my camera do. REHMSo you have a fancy camera. It's not a simple camera. PERELMANIt's not a very complicated camera. It's a DSLR which is what a lot of people are carrying around these days. PERELMANI use a 50 millimeter lens, which is just -- it's actually a portrait lens. I just like it for the very clear photos. I wasn't looking for bells and whistles. I just wanted things to be really sharp. REHMBut you know, I'm looking at your wild mushroom tart, and that, I mean, it looks as though you could cut right into it. PERELMAN...photos. I really don't like -- I didn't want to do any smoke and mirrors. There's very little styling. You rarely see anything more than maybe a dishtowel on the counter because it's just -- this is real cooking and this is what my kitchen counter looks like. Sometimes you see the dirty knife in the background that I used to cut the cake because I just -- I want it to feel and look like your kitchen, because if you -- if your food comes out the way mine did, then I've succeed, and I'm happy. REHMDeb Perelman, she's a self-taught home cook, photographer, and creator of smittenkitchen.com, and the author of a brand new book. It's called "The Smitten Kitchen: Recipes and Wisdom From an Obsessive Home Cook." Do join us, 800-433-8850. Send us your email to drshow@wamu.org, follow us on Facebook, or send us a tweet. I'm looking at vinegar slaw with cucumbers and dill. That sounds fabulous. PERELMANThat is one of my favorite things to make. PERELMANYeah. No -- most people don't. PERELMANThey're usually of an, you know, you don't know how old they are, you don't know what's in them, but I have this -- I've put a lot of different slaw recipes on the side and very few of them really follow that traditional mayo or buttermilk path. I really just like playing around with this idea of finely chopping ingredients for a raw crunchy salad, and although we make a lot over the summer, it's really nice with burgers and hot dogs and grilling, it's also really nice in January. PERELMANIt's kind of got this detox-y thing to it where you -- just eating something crunchy and fresh and raw, and it feels like the opposite of the heavy food you probably ate throughout December. REHMWhy don't you go ahead and read that. PERELMANLet's -- one medium head of green cabbage. This is about two pounds or 900 grams. You're going to core this, and you want to thinly slice it or shred it. One large seedless or English cucumber. Those large ones that are wrapped in plastic often are great here. It's about one pound or 455 grams. You're gonna slice this into round discs as thinly as possible. You want two tablespoons of chopped fresh dill. PERELMANIt's just really wonderful with these ingredients. PERELMANThey're meant to be together. We use half a cup of white wine vinegar, which is a nice mild vinegar with a neutral flavor. Two tablespoons of kosher salt. PERELMANWell, we're gonna be lightly pickling the salad, and you really want to use kosher salt for that. PERELMANIn most cases, table salt will do, but here I feel like that's important. PERELMANWe're gonna use four teaspoons of sugar, which sounds weird, but essential to the pickling. You want salt and sugar. And we're gonna use half a cup of cold water. Again, that's gonna be part of this pickling brine that it sits in for awhile. Toss the cabbage, cucumber and dill together in a large bowl. Don't be freaked out by how big the salad looks, it settles as it marinates. Whisk the vinegar, salt, and sugar together in a small bowl until the salt and sugar dissolve. PERELMANStir in the water. Pour the liquid over the salad and let it marinate, tossing the cabbage occasionally. After one hour it should be a bit wilted and crunchy. At two hours the flavor is even better. REHMOh, sounds wonderful. You created that because you love cabbage, you love slaw, but you don't like all the heavy mayonnaise that normally goes into coleslaw. What about adding a touch of shredded carrot? PERELMANIt's very green the way I show it. I happen to love the color green, but yes, for a variety. You could also use a mixture of red, maybe just -- maybe one cup of thinly shredded red cabbage, which will add a really beautiful variety as well. REHMAnd you could use red onion. PERELMANIt would be. The red onion might get -- it's gonna get kind of pink and translucent, but who doesn't like that? REHMWho doesn't like that? Absolutely. So when you first started writing this blog, what kind of reaction did you get? PERELMANYou know, it was a very slow growth. It wasn't like I just woke up one day and there were five million people showing up. So it happened very gradually. So gradually that I almost didn't notice it happening. It's just -- I'm still -- it's still kind of sinking in. But I remember that slowly comments started trickling in, and it was incredible to me. I remember the first time somebody said I put my kids to bed last night, and I stayed up and I made these muffins on your site, and I was like oh, my goodness. PERELMANYou had one hour of free time and you made my recipe? It was really flattering and humbling. REHMDeb Perelman, self-taught home cook, and the author of "The Smitten Kitchen Cookbook. Short break. Right back. REHMAnd here's our first email from Lauren. She says, "I love her website. I'm so glad to catch this interview. Her website is one of the first spots I go to when I have an idea but not sure how to do it. She makes everything seem so easy and accessible. Her buttermilk chicken is a staple in our home." What do you do with the buttermilk chicken, Deb? PERELMANYou start it with a buttermilk brine, or the best recipes do, and it adds this amazing -- by brining it, it becomes very -- the meat becomes very moist and rich and it adds a really neat tangy flavor to it. So for weekday night cooking, you're probably not frying chicken, so I just played around with just using the brine and just baking the chicken straight. Right before you put it in the oven, you take it out of the brine. PERELMANYou can soak it for an hour or you can soak it for a day, depending on your time, the amount of time you have. And you put it in a pan, you drizzle it with a little olive oil. I think I sprinkle it with a little bit of smoked paprika just for an extra flavor dimension, and it's just -- it may not be the prettiest chicken you've ever made but the texture is fantastic. It already tastes seasoned and ready to go, like the best part of the fried chicken. REHMNow, is that recipe in here? REHMNo. It's on your website. PERELMANAnd the reason is that I wanted the book to be a value for people who had been reading the site. I didn't want to just publish recipes that were on the website that you could just Google for. So 85 percent of the recipes in here are new and there's about 15 percent favorites from the site. And that means that you may not see something you love on the site, but you can still go there and look at it. PERELMANThis is new. This is something special. REHMNow one thing that's brand new and you're very proud of are your whole lemon bars. Tell us about them. PERELMANWell, how far back should we go? My mother won a contest for her lemon bars in the '70s. These are not them. I feel that every generation should be able to make their mark on the lemon bar. REHMHas its own, of course. PERELMANSo what I learned, and this is just through cooking other recipes, is that when you're working with lemon, you know, usually what you're stuck doing is you've got eight lemons, you're zesting them, you're juicing them. It's kind of a bit of work and -- but you can just take one whole lemon -- and I don't even mean a mire lemon, I mean, the unfancy grocery store lemons. PERELMANAnd you can grind it up in a food processor with sugar and everything else. PERELMANIt's so crazy. First you do cut it. You want to make sure there's no seeds in it. So you cut into thin slices to try to pop out any seed you see. But everything else is just right in there. And that one lemon perfumes the whole recipe and it makes these incredible lemon bars. And I actually do the whole thing in one pull. These are great for, like, the bake sales, for the oh-my-goodness-I-didn't-know-you-were-coming-over-let-me-whip-something-up. PERELMANBecause you can start by -- you make the crust in the food processor. You press it into an eight-inch square pan and then you bake it. And while you're baking it, you don't even have to wash out the food processor, I won't tell anyone. You pop the rest of the ingredients in. When it comes out, you pour on the lemon custard and you bake it again. And that's it. It's just so easy and it makes so little mess. REHMAnd that's different from the lemon bars you have on the website. PERELMANAbsolutely. Now the lemon bars on the website are also wonderful. They are maybe for those who are less nervous about using an entire lemon rind in their recipe, in their cooking. But they're more traditional. They use the juice and the zest and they are delicious. But these, for real lemon junkies, there's such a nice depth of flavor from using the whole lemon. REHMYou say that your kitchen is a typical New York kitchen, it's tiny. How tiny? PERELMANIt is so tiny that the two of us might fit in there together, but it might be a little uncomfortable. PERELMANWe have to be good friends. PERELMANIt's just -- it's tiny. 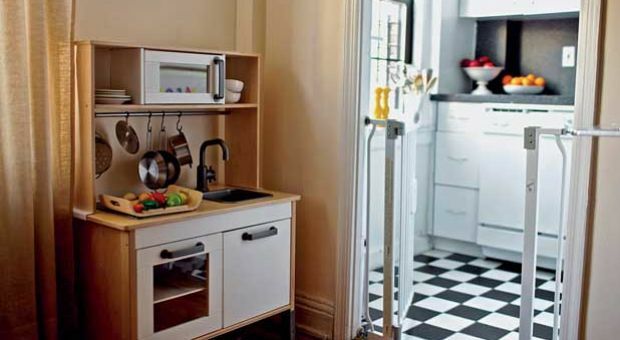 But don't feel -- you should never feel bad for a New Yorker with their small kitchen. Nobody makes you live in Manhattan with the ridiculous rents and those crazy tiny kitchens. In fact, I've grown quite warm to it over the years. It's got a window. It has a dishwasher, which we all know is a very important thing when you cook a lot. It's a little checkered-tile floor and, you know, I've kind of made it work for myself. PERELMANAnd I'd just gotten to the point that I don't even know that I'd jump at the chance to have a bigger kitchen. I'm just really used to it. REHMSo it works for you. You can make it work no matter what the size. PERELMANExactly. It can be frustrating at times. But at the same time, you know, when you go to a restaurant and you have this incredible food, all of those line cooks, they have a counter not much bigger than what I have at home. PERELMANSometimes smaller, and they put -- what do they put out? Hundreds of meals a night? So you just make it work. You just have to want it. REHMBut there is something else you point out in this book. You say there are no bad cooks, only bad recipes. PERELMANThat is my central belief when I'm writing recipes. I think that a well-written recipe could lead a completely inexperienced cook to make something great, exactly the way it's supposed to come out if they just follow the directions closely. I know that there are people who will tell you if you don't -- if you use recipes, you're less of a cook. And that there's this whole set of skills that you either have or you don't. I don't think you should listen to them. PERELMANI think that you should look for recipes that work, that will teach you to make things, like pie dough, like pizza dough, like lemon bars even if you don't know how to cook. And I think that should be the goal of every recipe writer. I don't know that I achieve it every time, but that's what I'm aiming for when I create recipes. REHMDo you think that there are some people who write recipes who want to make them sound more complicated than they really ought to be? PERELMANI think that sometimes recipes leave out detail, and that's really the traditional recipe writing style. It's hard to fault it. That's the way it was done when you read a recipe from 50 years ago. It might have two lines of instructions. I think the extra instructions are really great. I think it's really great to warn people, this dough is going to be really sticky and it's going to stick to your counter and you're going to think I have lost my mind. But trust me, that is correct. Wouldn't it be great? It's like a reassuring voice. PERELMANBecause, you know, it's okay if the dough is sticky, if people know it's supposed to be sticky. REHMYou know, you say your mom learned to cook by going through the whole Julia Child's "Art of French Cooking," I learned to cook with Craig Claiborne who did exactly that. He simplified the steps for producing really, really good food so that when having cooked with Craig Claiborne, having talked with him numerous times, I then turned to Julia Child. She seem more complicated for me than needed. PERELMANCraig Claiborne is an excellent recipe writer. It's entirely possible if my mom had turned on PBS one day and he was on, things might have gone differently. I may not like quiche as much. But I think -- what I really respect and I'm still wowed by what Julia Child did is that she never said, oh, you cannot get fresh peas in America? Therefore, you cannot make my recipe. PERELMANShe said, here's how to take your lousy, rationed canned peas and do as much as you can with them. No, it won't be the same, but I really loved the way she thought it was her job to adapt these recipes for the ingredients people can get. And I feel strongly that that's important. It's wonderful if you can get great market fresh produce that's a day old, you should use it if you can get and if you can afford it. But if you can't, you shouldn't be kept from really great food. REHMAbsolutely. How often do you go out to restaurants? PERELMANQuite a bit. Maybe not -- well, I have a three-year-old, so maybe not as much as I used to. But eating out in New York City is almost the norm because your apartment is tiny, your kitchen is tinier. Groceries are overpriced. You probably have a walk up and you're probably going to end up hand washing the dishes at the end of the night. So when somebody tells you they live in New York and they eat out four nights, we do not judge them. It's just the sane thing to do. REHMBut how often do you entertain at home? PERELMANYou know, a lot more before we had a kid. But I do like to just -- I do always have too much of things. You know, I've done a few rounds and my friends know if they want to come by, there will be something and they should come hungry. And it might be something random like lemon bars at nine in the morning or pancakes at 8:00 pm, but there will be something that I was working on that day and I hope they'll take it home. REHMWhat is it that makes you write so personally in your blog? What is it that brings the kind of emotional level of attachment to what you're doing? PERELMANMy goodness. You know, I'm not a trained journalist. I don't have an idea in my head of what writing is supposed to sound like, I just know how I talk. And so that's how I try to write. And I know that when I talk about a recipe that I'm really excited about, that's the stuff people need to hear, I think. That they want to hear that you didn't really like the way most of your weeknight -- Roast chicken was coming out and you had this idea and here's how you can change it. PERELMANSo I think just speaking to people in regular language -- of course, for me, it's the only way I know how to write, which is how I talk -- it can be helpful and hopefully relatable. I'm not trying to sound like I cook better than you or that I have some vast amount of knowledge that you'll never be able to tap into. I mean, it should be a conversation. And so, that's what I'm hoping to do. REHMHow do you have a conversation about cooking fish? PERELMANHow do I have a conversation -- I dodge it actually. Because -- see, now, everyone's going to find out that I'm not a big fish eater. REHMYou're not a big fish eater. PERELMANI made a halibut in the book with a friend's help. It was actually quite delicious. But my conversation is that I dodge it. REHMYou do? You really, really do. PERELMANI absolutely do. I mean, I feel like I know a bit about it just from reading a lot of recipes and seeing how other people cook it, but I don't have as much, like that first-hand knowledge, that second sense about it. REHMAnd would you put vegetables and fruits at the top of your emotional list? PERELMANI would say definitely. In fact, even meat which I, you know, do enjoy is more on the side for me. And the central thing is I think -- I remember very early on when I first moved to New York, we have this wonderful Union Square green market and maybe this is a little embarrassing to admit, but I would go there, I'm like, I don't know what these vegetables are, all of them. And even the ones that I do know, I don't have a go-to recipe, like a favorite way to cook them. PERELMANI think it's really great to have two or three ways that you love to make broccoli, sweet potatoes. PERELMANYeah, just so you can bring it home and you know exactly what to do with it. And that's a lot of the recipes that I've created come from that place where I said, who knew that you can take asparagus and you can peel it with a vegetable peeler into ribbons and then you can toss those ribbons with just about anything and make a salad. Or in the book, I sprinkled those ribbons on a pizza and they become almost crackly in the oven. REHMAnd what else do you put on there, besides the asparagus? PERELMANThere is mozzarella and a little parmesan and just a very simple dough. And it sounds very simple, but the flavor is surprisingly complex because you're really getting all of the flavor of the asparagus from the tips to the stems because you're cutting right into it. REHMAnd what kinds of seasonings would you use on that? PERELMANI'm a big fan of salt and pepper. REHMSalt and pepper it is. PERELMANI'm old school. I think that when you go to a restaurant and you think that their food is so amazing and that you're never going to pull it off, it's really about salt and pepper and of course they have a much more heavy hand with fats and creams than we do at home. I did not say that we always want to emulate that, but I think that in most cooking it really comes down to just having salt and pepper. REHMDeb Perelman, and her new book is titled, "The Smitten Kitchen: Recipes and Wisdom from an Obsessive Home Cook." And you're listening to "The Diane Rehm Show." We're going to open the phones, 800-433-8850. First to South Haven, MI. Good morning, Susie. SUSIEGood morning. First of all, I want to say, it's nice to hear your voice, that someone actually I've been cooking with for the past couple of years. REHMIsn't that lovely to hear? SUSIEAnd my other question, I know that you grab a lot of your recipes from your mom and such, but where do you get your original-ness in some and you were putting in to what you do, does it bother you when we grab yours and them into our own inventions? PERELMANNo, not at all. I think that's the best part of cooking, not being overly rigid about where you -- the way the things are meant to be. It doesn't really matter whether I think asparagus pizza should taste this way. It matters whether you like it. So if you like it with a handful of chili flakes and a squeeze of lemon juice over the top, well you should make it that way. So I think it's wonderful. PERELMANI sometimes start with established recipes. But more often these days -- and I think this happens to a lot of cooks as they get more comfortable skin and in their own kitchens is I'm working from formulas. When I start making risotto, I remember the proportion of rice to liquids that I find works fairly successfully. From there, it's what you do with it. Maybe instead of shallots, you use garlic. Maybe instead of wine, you deglaze it with beer, which is actually something I do in this recipe in the book. PERELMANSo from there you can play once you have these basic structures. You're not limited to the way risotto has always been. REHMAnd, Susie, one additional point, this interview with Deb Perelman is being videotaped, so in about an hour you should be able to see clips at our website, drshow.org. Let's take a caller here in Washington, D.C. Good morning, Kate. KATEHi. I'm calling with -- first, thanks to Deb, because I've been reading your blog for years and years and have never made anything bad off of it. KATEAnd I'm also wondering, I'm expecting my first child in about a month. KATEThank you. We're a little bit intimidated. We cook a lot. We love to cook. We're a little bit intimidated about how that might suffer when we have a, you know, we have a little baby to care for. And I know you've got a -- I think he's two now and I'm wondering how that changed for you. PERELMANWell, I don't want to scare you, but it changed tremendously. But not always in a bad way. I've started thinking about food a lot differently. When it was just my husband and I, when something had a lot of leftovers, I found this bothersome. I don't want to eat the same thing two to three days in a row. Let me just tell you how excited I am about leftovers these days. PERELMAN...while I have a hungry toddler pulling at my skirt. But, you know, if you're -- I hear from a lot of parents who were better prepared than I was, that they want to sort of pack away some food for the first couple of months in the freezer, kind of freezer meals. And for those, I definitely gravitate towards baked pasta dishes, lasagnas. If you like arroz con pollo, that's really wonderful. They're stewy chicken dishes. PERELMANThey're really great to defrost a brisket if you eat meat. Things that you can kind of just heat up, then taste fantastic after sittings. They actually get better with age. And maybe you can then just cook up some rice. But it won't -- I think it's not as bad you hear as well. PERELMANBecause you will have these -- they do -- they sleep a lot in the beginning. They sleep almost all the time and you will be hungry, like so hungry. And so you will find ways in the Bjorn or whatever else to get into the kitchen and make what you want. REHMAnd Deb Perelman has been spending lots of time in the kitchen, you will as well once you see her cookbook, 800-433-8850. Stay with us. REHMAnd there's so many callers I think we best go right back to the phones. To Nancy in Pittsboro, N.C. Hi there, Nancy. NANCYGood morning. I have a question about the slaw recipe that -- or really about slaw in general that Deb read on the phone. I've been working on trying to find a good slaw recipe but my question is about the brine. I was told that it's best to soak the cabbage after it's sliced in, you know, saltwater for, I don't know, a couple of hours I guess and then drain it. And then mix it with the rest of the salad. Is that what your recipe requires or how does that -- or is that even necessary? PERELMANIt's not necessary, but it's -- it depends on what you're trying to get with the cabbage. In a lot of slaw recipes, you're looking for a softer -- the cabbage to be softer and more limp and for it not to release its water into the dressing. It would really dilute a mayo dressing. So in mayo-based dressings, you would see that a lot with cabbage. I do not find it necessary for this because it's actually in a wet brine. It's actually sloshy in the bowl so that water just adds to it and nothing bad happens. So it'll get limp right in that dressing and it's not necessary to presoak it. REHMDoes it crisp up again? PERELMANAbsolutely. When I mean limp, I mean that it relaxes. You know, you'll start with this gigantic mound of cabbage and you'll have a bowl by the time you're done, which is why I warn you, don't freak out about the amount that you're making. It will all work out. So it will relax against each other, but it gets very crisp and stays crisp for days in that brine. REHMHope that helps, Nancy. To Norman, Okla., good morning, Stephanie. STEPHANIEGood morning, Diane and Deb. I'm so excited to talk to you both. STEPHANIEWell, Deb, I'm also a mommy slash lifestyle slash food blogger and I wanted to tell you that I appreciate the real photos because while I really love food blogs to have beautiful pictures of food and crisp white backgrounds, my photos have Leggos mixed with the dishes. PERELMANExactly, as do mine, Sometimes Sippy cups. STEPHANIEYeah, and I really appreciate just the real mess of it because I don't have time to go stage my food somewhere else. And I wanted to ask if -- I mean, I'm a relatively new blogger, just two years old. Do you have any advice for somebody who's not necessarily in a specific niche or just what's your take? PERELMANWell, first of all, two years is fantastic and I would not call you a new blogger at all. I think once you've done it for two years you have a very good idea of what you enjoy doing, what your rhythm is, your style, which I think is great. It's harder for me to advice people right out of the gate because I think it takes some time to sort of try different things out and see what parts of it you like and which parts of it feel like a chore. PERELMANI always think that you should get rid of the parts that feel like a chore because this should be a wonderful hobby that you enjoy. But you've been doing it for two years. You're probably in really great shape. And I think that, you know, the only thing that you--you need to enjoy it. I think that's the main thing. You shouldn't feel like -- if you feel like other people are doing this food styling or other people are running more contests or other people are doing more, you don't have to do that. You can just follow your own rules because I have and I'm really glad I did. REHMThere is a recipe on page 87 and I'd like you to read for us what you've written about this recipe. First tell us what it is. REHMI would like you to read that paragraph. PERELMANOh boy. Now we're going to see some blushing on the camera. Oh, stop giving me that look. I know my tastes in grilled cheese are weird. My husband says so all of the time. He says that normal people embrace, not fight, those good old jellied individually wrapped orange squares of American singles. Normal people enjoy an occasional slice of white bread, or at least a soft whole wheat in their cheese sandwiches. Normal people leave it at that. Grilled cheese was never broken, so why try to fix it? PERELMANI found if you call it a Panini people let you put whatever you want between your slices of bread. Vegetables and sweet things and nontraditional cheeses are allowed to melt and muddle together in peace. If it helps, you can pretend this is a Panini, but I hope you trust that there's great deliciousness within. Those onions are cooked slow and low until sweet and tart and resonating with immense flavor. PERELMANSwiss cheeses have a vaguely bitter nuttiness that goes dreamily with this. And rye, well, I know you probably don't like caraway seeds. It seems nobody does. So if you can't find seedless rye and you can't find the best substitute, which is a seedless pumpernickel, you can use plain old white or whole wheat bread. But I think you're missing out. PERELMANP.S., this is amazing with a side of that vinegar slaw. PERELMANI'll be right over for dinner. That sounds fantastic. PERELMANOne tip I have for people who -- I actually love caraway seeds but I also love their flavor. If you think that you may not want that crunchy seed, almost wiry inside your bread or whatever, you can use your spice grinder. You can use your coffee grinder to grind spices and that way you get that amazing caraway flavor but with that bit in there that might be unpleasant to chew on. REHMAll right. To Titusville, Fla. Good morning, Patricia. PATRICIAGood morning, Diane. Yes. We're eating our way through a second batch of apple cider caramels. Just wanted to let you know. PATRICIABut anyway, my past life was a kitchen and bath designer for seven years. And my comment has to do with just the overload that I saw in people's kitchens that never really cooked. And it used to bother me. I guess I -- after a while you get over it, but I applaud your minimalism even though it's forced. But I just wanted your thoughts. I'm a big believer in, you know, buy the best knives you can afford. You know, make things do double and triple duty so you don't have so much crap in your drawers. PATRICIAThat was something that, you know, people would pay big bucks for all the storage space for stuff and really not use it. So I know you're in a cramped space. Can you elaborate? PERELMANWell, you know, something I see a lot actually in larger kitchens and now I sound -- I mean, I sound terribly judgmental and you'll never invite me over but I just want to tell you that I see a lot of stuff on the counters. And that's great because if you have five counters you can do that. But I often feel like this -- the bare space on most counters is no bigger than what I'm using. So I -- if you're feeling constricted in your kitchen, clear the decks. Give yourself a nice open space to work with so you're not running into the toaster oven or the still warm coffee machine. PERELMANBeyond that, I am a big advocate of not buying things until you desperately need them. To not just go out and buy something because a chef told you, you probably will want a set of nested mixing bowls at some point and a good knife. But you can first try to use what you have and see how much it irks you not to have it before you go out and invest in something that you may not need. PERELMANIn fact, after cooking with sort of an inferior -- you know, you're using your cups and bowls and mugs from the cabinet, you may find you didn't need what you thought you first might. So I think it's okay to wait to purchase things. And I also think that it's okay to not -- yes, I am a big fan of having a great knife. And, you know, the holiday's coming up. It's a wonderful gift. Maybe not everybody's families give each other knives for Christmas, maybe that sounds a little weird. But it's a great gift and it's a nice thing to ask for. PERELMANBut in the meanwhile, you know, some mid-priced knives that holds a good sharp edge will get you through a lot of recipes and wonderful meals. And then one day you can, you know, upgrade. REHMAbsolutely. Thanks for calling, Patricia. How do your husband and son play into your cooking? PERELMANThey are -- well, my husband is very enthusiastic. He is -- he's wonderful because I have this very strong orientation towards vegetables. And he is a guy who if I wasn't cooking for him would be very happy to probably have chicken and steak most nights. But he also loves vegetables, too. So if he came home and I said, I made us a faro pilaf and some roasted broccoli, he'd be -- he's say sweet, great. I'm sitting down. PERELMANMy toddler is wonderful but he is three and I do not want you to think that I have some sainted toddler who never throws his fork across the room. Well, okay, that would be a timeout. But, you know, that never gets his meal and says, I don't want to eat this. How could you think I'd eat broccoli, mom? So that -- he is a normal toddler and he is occasionally enthusiastic. Sometimes he even says, this is delicious, mommy. PERELMANBut a lot of the times he acts like it is the enemy and then we just ignore it because I know it's going to go away one day. REHMBut you have -- clearly you have a potential male cook in the household with this three-year-old toddler. What are you doing to involve him in the kitchen? REHMin the kitchen. Good grief. PERELMANWhich does not fit. My ankles hurt, but it's very cute. He's got his little bell and everything and he's singing usually. So he's darling. So I've been trying, hey Jacob, do you want to smell this lemon? Do you want to see what this spice is like? I got him involved in peeling hardboiled eggs a few weeks ago. PERELMAN...it was not hardboiled. So I took a couple pictures with my cell phone and then I took it out of his hands because it was actually really cute. So he's enthusiastic. REHMHow about your husband? Is he a cook at all? PERELMANHe probably is if I would let the poor man in the kitchen. I know that's the thing that your mother would probably tell you not to do when you get married. Do not kick your husband out of the kitchen because they may never come back in again. But my husband is absolutely capable of following a recipe and he's absolutely capable of chopping vegetables and whatever. But I do kind of take over in the kitchen. REHM...and creating meals for himself and his sister. It seemed to me that he needed to learn to cook. They are both fantastic cooks but I've told this story before. My won and his wife met each other at a potluck supper. He walked in with a great big bowl of salad, an apron and rubbery gloves ready to wash the dishes. She took one look at him and said, that's the man I want to marry. PERELMANVery smart. I'm so impressed by the rubber gloves too. PERELMANNot just washing dishes but taking care of his hands because he's clearly somebody who does it often. That's fantastic. REHMHe's a pianist as well. That's why the rubber gloves. To Warrenton, Va. Hi there, Paula. PAULAIt's really great to talk to you both. PAULADeb, I've been following your blog for years and I have to say I'm a huge fan. PAULAAnd I feel like, you know, you're a close friend of mine and now I realize I'm sharing you with thousands of other people. PERELMANForget about them. It's just you and me. PAULARight. I love the fact that you do such wonderful cooking in a little kitchen. You don't use extravagantly strange ingredients. You know that cooks have time constraints and family constraints. And, oh my god, Jacob is the cutest thing in the world. PERELMANI mean, I think so, but thank you so much. REHMAnd you're listening to "The Diane Rehm Show." Here's an interesting question from Dayton Beach, Fla. Hi, Pat, you're on the air. PATHi. I don't know how interesting, but I have an oven that has four shelves -- two grates and four shelves. And I need to know which shelf should I put the grate on when it says put it in the middle of the oven. PERELMANYou should -- well, I think you're probably more familiar with your oven than anyone. I -- for me and my oven, I would actually gravitate towards the top third rather than the bottom third because I find that when I put things closer to the top of my oven, I get better browning on the top. And when you pull something out of the oven that's a little bronzed on top, it looks twice as delicious. PERELMANSo I would say whichever -- whether towards the top or whether to the bottom, you feel like you're getting better color on your food is a good way. PATAnd something like biscotti, just switch them around like (unintelligible) ? PERELMANSwitch them around. Yeah, I definitely think you should rotate your pans halfway through the baking. Some ovens are more even than others. If you've never noticed uneven color you may not need to do it but it can never hurt to shuffled things around while baking. REHMThanks for calling. To Tuscaloosa, Ala. Quansine (sp? ), you're on the air. QUANSINEWell, hello. Thank you for taking my call. QUANSINEI did have a comment that I'm so inspired by listening to the show that I say I'm going to make it a priority to spend more time in the kitchen for my family. As a young mother I though, you know, coming from China and during the time that were when people were starved and coming to the college food lines, everything was so plentiful. And so hence I gained a bunch of weight. And then after I became a young mother, I decided that an apple for lunch was enough nutrition. So I turned my attention more to feeding the brain than feeding my child. REHMOh good. I'm so glad. PERELMANThank you. It's so wonderful. Thank you. REHMAnd here's a Tweet from Jen, Deb, who says, "I'd love to hear Deb's favorite turn-off-the-radio-and-go-make-it recipe from her new cookbook. PERELMANWow. Um, that has to do a lot with what you're craving. That's my caveat but one of these recipes that I have just made over and over and over again is the broccoli slaw. And I know you're thinking, broccoli salad? But it is so addictive. It has all of, you know, this green, your iron, all these nourishing things. It's crunchy, it's great cold, it keeps well. And so when I see it, I actually wish I could go back and make it again. PERELMANOh, you want me to read -- okay. (unintelligible) I have to find the page very quickly. PERELMANBut the gist of it is that you take two heads of broccoli, about three-quarters to a pound each. It's really hard. They really range so go by the weight, Half a cup of thinly sliced almonds toasted, a third of a cup of dried cranberries coarsely chopped, half a cup of buttermilk well shaken, half a cup of the dreaded mayonnaise -- but I promise the dressing is so light -- two tablespoons of cider vinegar, one teaspoon of granulated sugar, half a teaspoon of table salt and half of a small red onion finely chopped, lots of freshly ground black pepper. REHMOh, it sounds so good. PERELMANBut you keep the broccoli raw, you cut it thinly and you toss it with all these other ingredients. The dressing mostly just clings to it lightly. It mostly rolls off and it's just so wonderful for lunch. REHMDeb Perelman and her new book, "The Smitten Kitchen" recipes and wisdom from an obsessive home cook. We'll have a couple of her recipes up on our website. You can check out the clips from the video in about an hour. Congratulations, Deb. REHMJust wonderful. Thanks for listening all. I'm Diane Rehm.